The implants themselves are tiny titanium posts that are surgically placed into the jawbone where teeth are missing. These metal anchors act as tooth root substitutes. The bone bonds with the titanium, creating a strong foundation for artificial teeth. Small posts (abutment screw) that protrude through the gums are then attached to the implant. These posts (abutment screw) provide stable anchors for artificial replacement teeth. Learn more about dental implants! 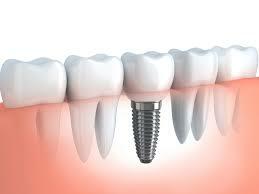 The placement of dental implants involves two procedures. First, implants are placed within your jawbone. For the first three to six months following surgery, the implants are beneath the surface of the gums gradually bonding (integrating) with the jawbone. You should be able to wear temporary dentures and eat a soft diet during this time. The second phase begins, after the implant has bonded (integrated) to the jawbone. The implants are uncovered at that time and the small posts (abutment screws) that protrude through the gums are placed. These will act as anchors for the artificial teeth. When the artificial teeth are placed, these posts (abutment screws) will not be seen. The entire procedure usually takes six to eight months. Most patients experience minimal disruption in their daily life.